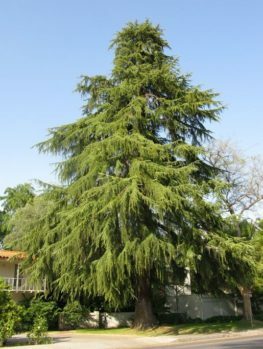 The Golden Himalayan Cedar is one of the most beautiful specimen evergreen trees in the world, and it has the great advantage of growing rapidly when young, soon becoming a handsome specimen on your lawn. It then slows down, and does not grow enormous, even when older, so it is a great choice for medium-sized gardens. It brings majestic beauty on a smaller scale. In spring the new needles are creamy-yellow, glowing and shining in the new season, and a vision of extraordinary beauty. The color gradually changes to a yellow-green, still beautiful, and then in fall to a light green that is attractive all winter. Plant this tree with plenty of room around it, as the horizontal branches, ending in weeping tips, are broad and look best when not crowded against other plants. 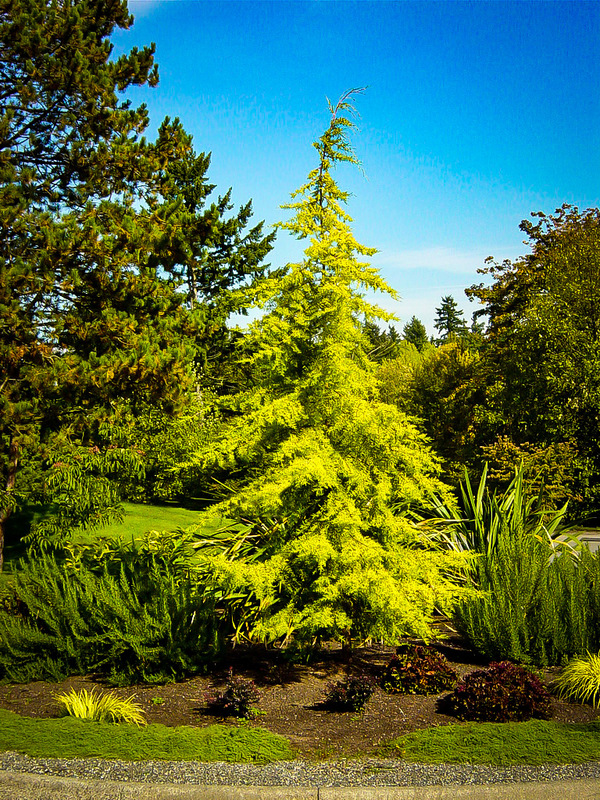 Plant the Golden Himalayan Cedar in full sun, as even partial shade will reduce the golden effect of the foliage. It grows best in deep, well-drained soils of any kind, including alkaline soils. Once established it tolerates ordinary summer drought conditions well, and it requires no special care. Avoid locations with ocean salt-spray, or urban pollution. Pests or diseases are normally not problems, and the only pruning needed is to remove lower branches as they are overtaken by upper growth, and to prevent the development of two central stems, by removing one when a pair is seen developing. 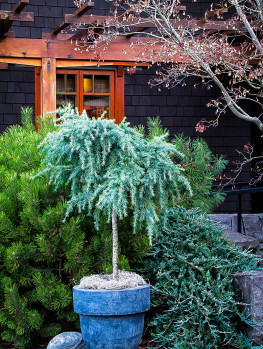 If you have the room, every garden should have a majestic evergreen tree on display, bringing interest all year long, and bringing a look of maturity and even grandeur to your garden. Symbols of long life and stability, these trees should be carefully placed, so that they can grow to their full extent. Always space them well away from buildings and other large trees, leaving them room to develop their full beauty without obstruction. In a smaller garden this can be difficult, so then it is important to find a tree that is both majestic and beautiful, but which won’t in time become too large. 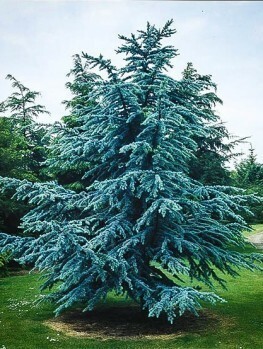 If you have a smaller garden and are looking for a very special, and very beautiful evergreen specimen tree like that, then the Golden Himalayan Cedar has to be a top choice. It achieves that grand look while still quite young, and although it will reach 12 or 15 feet tall within ten years, it will probably never exceed 25 or 30 feet in height, as its early rapid growth slows dramatically with age. This is the tree for lovers of classical beauty and grace, and of class rather than flash. This tree is easy to grow, and it will become handsome and mature-looking at an early age. With every passing year its grandeur and spectacular appearance will increase. What makes it even more special is the wonderful foliage effects that happen through the year. 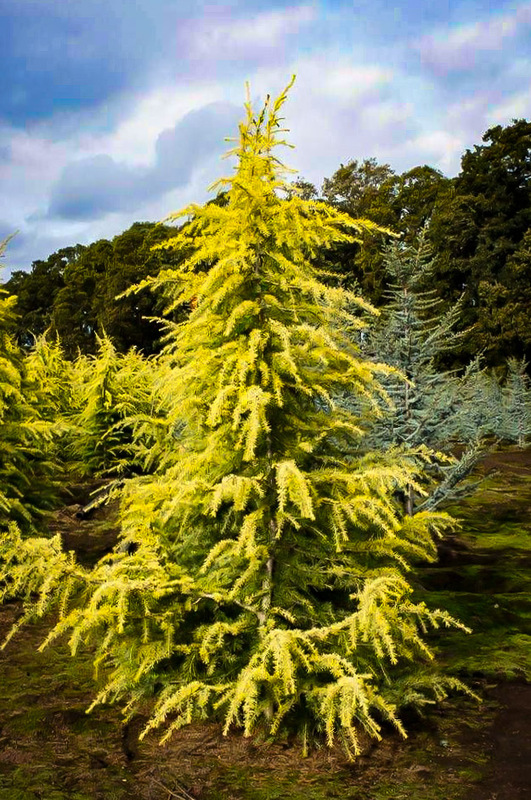 In spring the new foliage is a glowing creamy yellow – full of boldness and promise – and this matures to a beautiful soft, light golden-green, much brighter than the often dark and somber colors of many large evergreen trees. Through fall and winter it will become darker, but it will still carry a hint of that lime glow, until the new growth of spring starts the cycle over again. Plant this tree on a lawn in an open place, where it can be seen in isolated glory, with other plants well behind or low in front, not crowding against it. 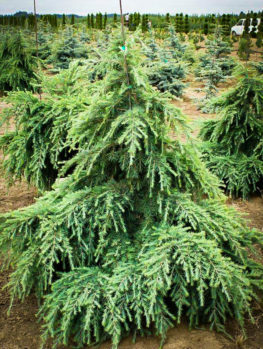 The Golden Himalayan Cedar is a tall conifer evergreen, with a strong, upright central trunk and almost horizontal side branches. Younger trees have a more dramatic weeping habit, which gradually changes into the mature horizontal form, with weeping branch tips. The branches develop into layers, like an irregular wedding cake perhaps, and the golden foliage glows against the dark, almost black bark, creating a picture of grace that is hard to find in any other tree. The needles are in clusters of about 30, studded along the stems after the first year of a shoots’ growth. These needles are between 1 and 1½ inches long. Older trees may produce fat, upright cones 3 or 4 inches tall. Young trees grow as much as 12 inches a year, so you can look forward to the rapid development of your tree. 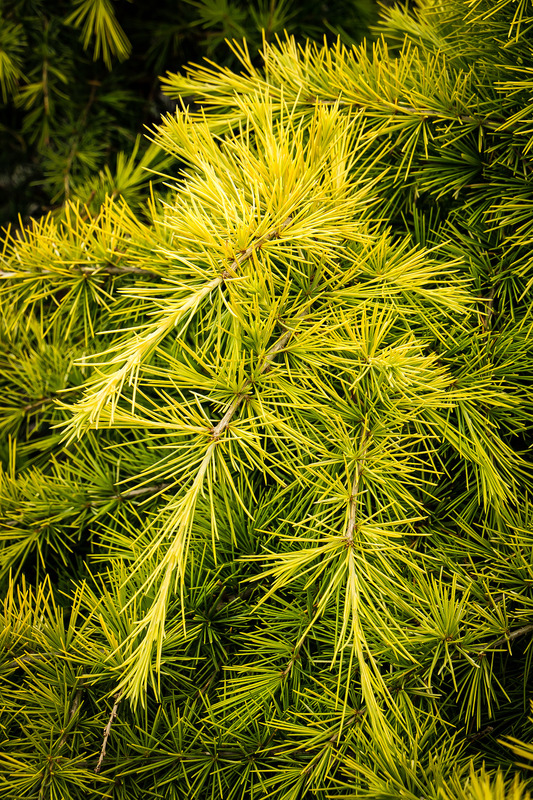 Plant the Golden Himalayan Cedar in a spot where it is in full sun all day long, all year round. In shade the foliage will be much greener, and the yellow effect will be reduced. 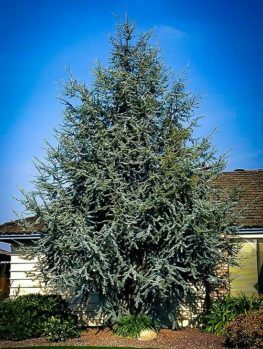 This tree is easy to grow in most gardens, but it really thrives in climates with some rainfall all year round, and with moderate temperatures in summer and winter. It grows best in deep, well-drained soil, but this can be sand, loam or clay, and acid or alkaline. In fact, this tree is a good choice for alkaline soils, where it thrives. Young trees should be watered regularly to encourage a large, deep, root system, but once established they have good tolerance of normal summer drought conditions. This is a tree that does not tolerate salt-spray, so sea-side planting is not recommended, and it does better outside the polluted air of big cities. It has no significant pests or diseases, and no special care is needed. As the tree grows, the upper branches tend to shade out the lower ones, so once you see weaker growth on low branches, it is time to remove them cleanly at the trunk, developing a taller trunk in time. Should you see two central trunks developing, choose the most upright and remove the other by cutting it back to a low bud. A single trunk is more attractive, and safer, as a double trunk can split. 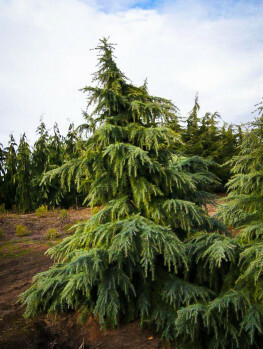 The Himalayan cedar (Cedrus deodara) grows in Afghanistan, Pakistan, Tibet and Nepal, in mountainous regions thousands of feet above sea-level. Wild trees live for centuries and are commonly 150 feet tall. Ancient trees may be 250 feet in height. This species is closely related to the famous Cedar of Lebanon but is much more attractive that that tree when young. This is a great advantage in choosing it for your garden, because it will soon be a beautiful specimen. 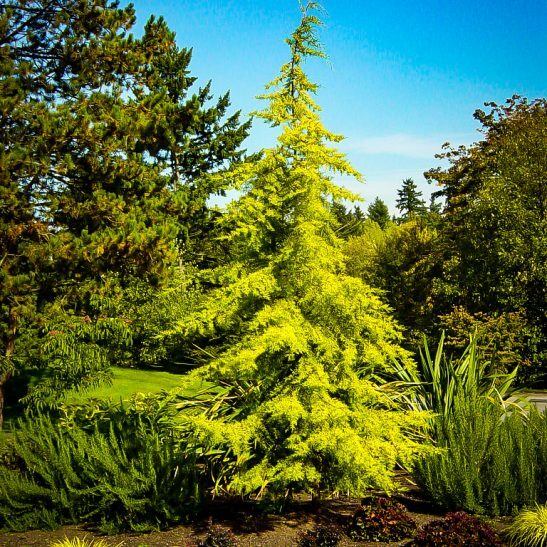 The variety ‘Aurea’ which we call the Golden Cedar, was probably first discovered as a seedling, and we find it first mentioned around 1866. It has truly stood the test of time as a beautiful tree of outstanding qualities. Our trees are raised correctly, by attaching stem pieces to the roots of seedling cedars, to be sure you get exactly the golden form, and not a cheaper seedling plant. 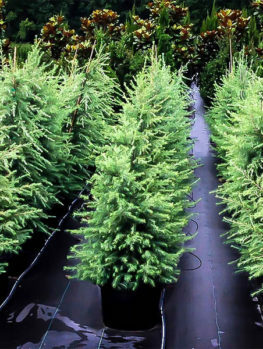 These beautiful trees are always in high demand, so order now. It’s a choice you won’t regret.